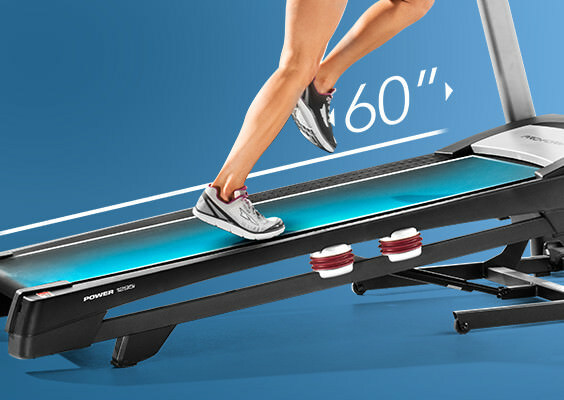 The SMART Power 1295i is a new treadmill from ProForm recently introduced to the lineup and updated in 2019. It joins the 995i as part of the Power series, with a strong motor, high contrast screen and a generously sized runner's deck, among other great features. It sits right in between the base series and the top of the line Pro models, and as such is a good option for those that want a solid treadmill with a nice array of features and built in workouts, but want to save a little bit of money. The ProForm Power 1295i features the patented space saver design which easily folds up after your workout for storage. It has a bright 7" high contrast screen display showing all of your relevant workout stats, plus it's connected to the internet with an Android browser for entertainment. The Power 1295i is a welcome addition to ProForm's treadmill lineup, as it offers a nice mix of features, especially for a sub $1500 machine. You get a very large sized running deck: 20" wide and 60" long, so it can easily accommodate any sized user with plenty of room to stretch out. The belt is also maintenance free, so it'll provide years of use without any issues. It also has ProShox cushioning to reduce impact on knees and joints. The 1295i also provides up to 15% power incline capability, a strong yet quiet 3.5 CHP motor, and 34 built in workout apps. One of the most appealing upgrades is the 7" high contrast screen, something you'll find on more and more treadmills these days, but usually at much higher price points. Note that the base 995i model has a round LED display. Everything is displayed brightly and clearly, and you can not only see your stats like distance, calories, time, incline, program, etc. but you can also watch videos, check out your social pages and look things up, as it has a browser built in. Early reviews have been very positive, and many highlight the inclusion of iFit Coach technology, which is the latest version of ICON Health & Fitness' popular program. This is an incredible extra, giving you access to even more trainer designed programs, personalized nutrition, tracking and sharing capability, and best of all, Google map integration. This allows you to choose any location worldwide, and the treadmill will automatically adjust its incline to match the terrain you choose. That's one of the coolest features for sure, and really helps motivate you to reach your fitness goals. The treadmill offers a 350 lb. max weight capacity, as well as a generous warranty: lifetime on the frame and motor, 5 years on parts and 2 years on labor. That's very solid for a machine in this price range. How Does the SMART Power 1295i Compare to the Other ProForm Treadmills? The Power Series sits right in the middle when it comes to ProForm treadmills. It's a step up from the Performance Series, yet not as durable as the Pro Series. 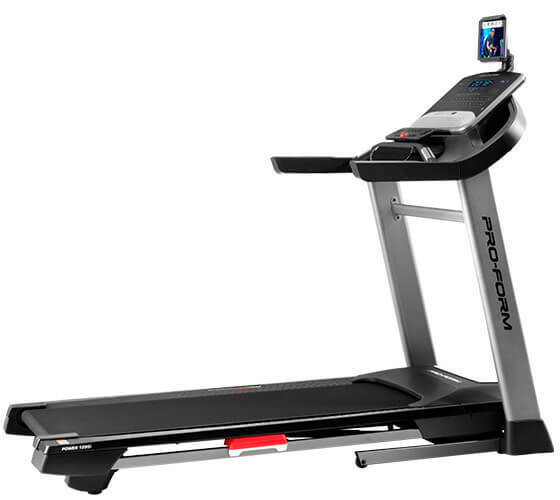 There are only two treadmills in the Power Series: the base 995i and the up-level SMART 1295i. Let's look at the two to see how they compare. The 995i gives you a 3.0 CHP motor, 20" x 60" deck, up to 15% incline, 30 built in workouts, a round LED display and a 300 lb. max weight capacity. The 1295i steps it up with a 3.5 CHP motor, 34 built in workouts, a 7" bright display, a 350 lb. max weight capacity and a stronger warranty. So the 1295i is much more advanced than the base 995i, and worth buying if you have the budget for it. The lesser Performance Series, which includes the 400i and 600i, gives you less incline ( only up to 12%), fewer built in workouts, weaker motors and shorter warranty periods. Those models are only worth considering if your budget is really tight, or if all you will be doing is some light walking and perhaps some jogging. The top of the line Pro Series, which includes the Pro 2000, 5000 and 9000, gives you stronger motors, decline capability on top of incline, stronger construction and touch screens on all. Our favorite ProForm treadmill is the SMART Pro 5000, which is our expert's top pick for home use. It's a couple of hundred dollars more expensive than the ProForm SMART Power 1295i, but well worth it in our opinion for all of the additional features and capabilities you are getting. The SMART Power 1295i is a great step up from the 995i, and at only an additional $500 or so it's well worth it for all of the upgrades. On top of the bright screen, you get a stronger motor, more workout programs and a stronger warranty, so in our opinion it's a great choice if you are deciding between the two. Definitely consider the Power 1295i if you are looking for a feature packed treadmill under $1500 with incline, good cushioning and plenty of motivational tools to keep you on track to get into great shape. Also take a look at the Pro 5000, a Treadmill Talk Best Buy for home use and one of the best machines in the lineup. Get the popular ProForm SMART Power 1295i on sale right now!